Come visit the Nepal that is known as the Asian diamond. The country is now safe to visit !! 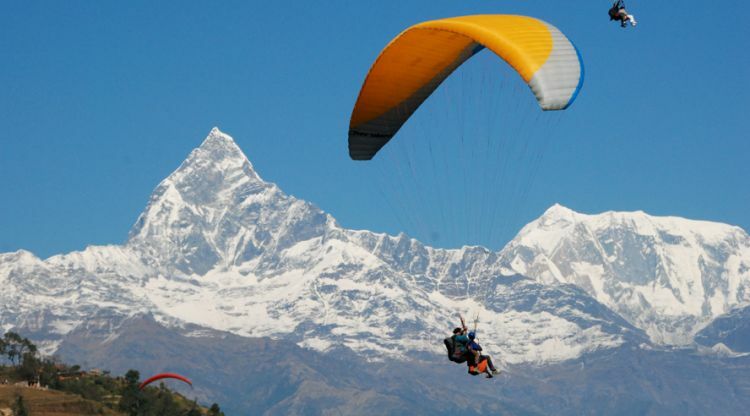 Paragliding is one of most adventurous sports in Nepal. If you would like to fly like a bird in the air and feel the beauty on the ground that paragliding is for you. Nepal in recent years has become synonymous with paragliding. This is partly due to the fact that Nepal offers some of highest and most natural spots for a take off and an array of the most amazing views of the Himalayas, lakes, rivers, valleys and green rolling hills. Appreciating the beauty of the tallest Himalayas is no doubt one of the most inspiring thing you can do on a paragliding. Sarangkot at 1592m is perhaps the best know launching sport for paragliders in Nepal. Located in the scenic valley of Pokhara, Sarangkot gives us the closes views of the beautiful Phewa Lake and magnificent Himalayas including Annapuranas and Macchapuchre (Fist tail mountain). There are various choices available for flyers such as tandem flight, solo flight as well as training courses. Paragliding can be experienced throughout the year however Spring and Autumn are the best seasons due to clear visibility and balmy climate. Your stay in Nepal isn’t complete without a paragliding adventure for sure.